Typically, the ACL is injured in a non-contact, twisting movement involving rapid deceleration on the leg, or a sudden change of direction, such as during side stepping, pivoting or landing from a jump. Injuries are often associated with a popping sensation followed by swelling in the knee over the next few hours due to bleeding from the torn ligament. Typical scenarios include a footballer or rugby player who catches his foot in the ground as he tries to change direction, a netball player who jumps and lands awkwardly twisting on their bent knee with their foot out to the side and a skier who catches the ski at slow speed and twists their leg out to the side. There are many other scenarios of course and depending on the exact mechanism it is also possible to damage the joint surfaces (articular cartilage), or the meniscus (footballer's cartilage). Injury to the ACL is diagnosed by detecting an increase in the forward movement of the tibia in relation to the femur. 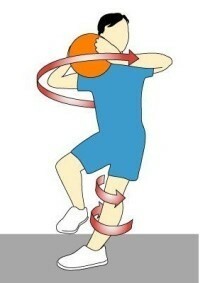 Normally such movement is prevented by the ACL. The examining doctor gently grasps the tibia and the femur and tries to detect the increased movement. Another of the tests is the Pivot Shift test, which gently reproduces the giving way sensation as the knee is slowly bent. Done carefully these are painless tests and can accurately diagnose a torn ligament. Often the diagnosis can be made from the story - a pivoting twisting movement associated with a pop sensation and the feeling of immediately not trusting the knee. Others nearby may have heard a pop and thought the leg was broken. Early swelling is common, and it is not usually possible to carry on playing - and any attempt to do so often results in the knee giving way again. Plain X-rays are likely to be normal and do not exclude injury to the ACL. MRI scanning is very useful in assessing injury to the ACL, but the findings need to be correlated with the assessment by the surgeon. "The National Ligament Registry (NLR) aims to help improve the management and outcome of knee ligament reconstructive surgery."